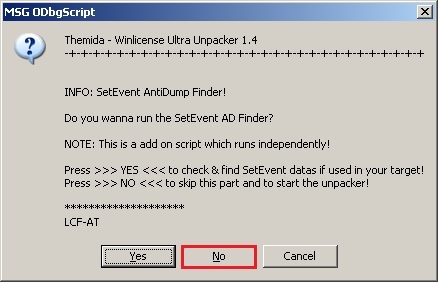 Today I will be showing you all how you can unpack a sample which is packed with Themida. This tutorial will show you how to do the process without requiring to manually use a debugger yourself. Themida is software specifically engineered to help software stay better protected from becoming cracked and/or it's source code was being stolen. If someone comes along and they can read the code you wrote for your software, if you have not made the software opensource and did not wish the code to be given out and/or read by someone, would you be happy about them having found a way to read your source code? I don't think you would. The purpose of Themida is to help prevent the protected software from becoming vulnerable to reverse engineering attempts. It can also help against piracy. 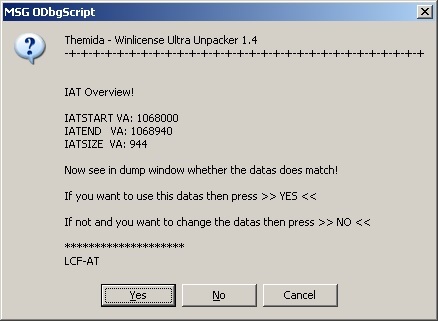 Themida will pack the executable. When you execute the packed sample, it will unpack the executable in memory and use that to continue executing to perform and do what it's meant to do. If the unpacking of the packed executable into memory fails for whatever reason, then the program will not work. Packers may be used in legitimate software so the developer's software is better protected against attacks. If someone can read your code, or use Disassembly to understand how it works, they can try to find vulnerabilities and then use them to create zero-day exploits. 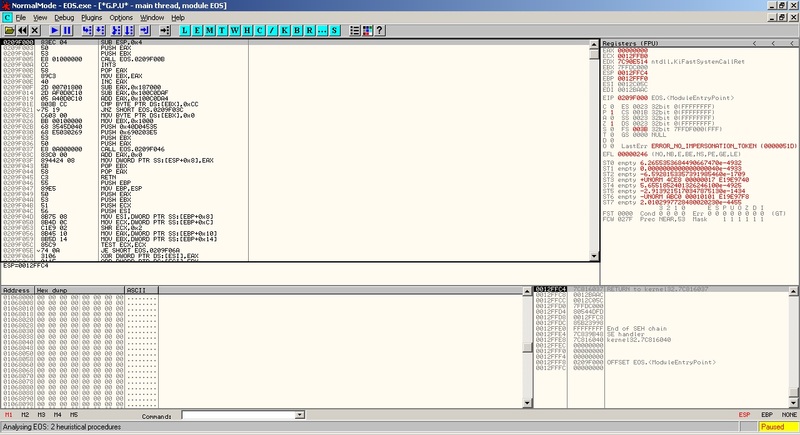 Packers are also quite frequent with malware. 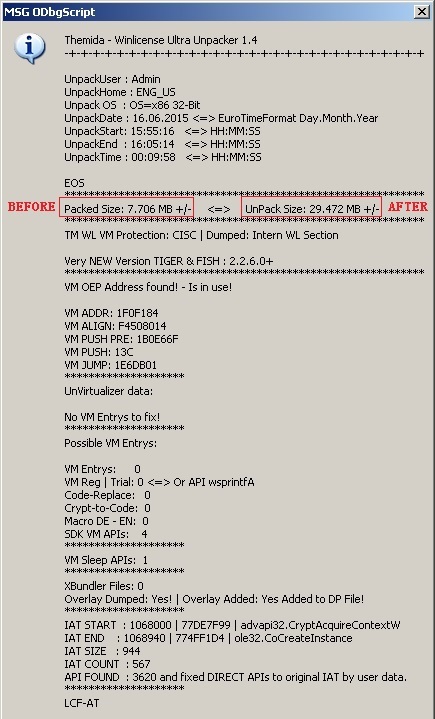 Your Antivirus product may pickup detections for software packed in a certain way/type of packer used. If the sample is packed, then this essentially protects against Disassembly. 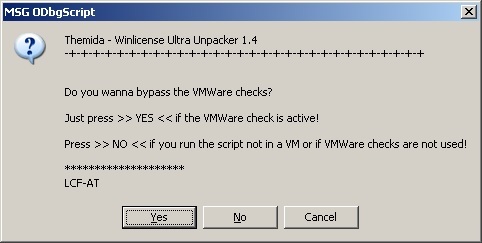 We won't be able to understand how the program works, we'll just be reading the instructions from the packer wrapper. For example, the process of the unpacking. However, we want the original executable (unpacked executable) and we want to perform Disassembly with that executable so we can try to make sense of and understand how the program works to know if it's malicious or not. 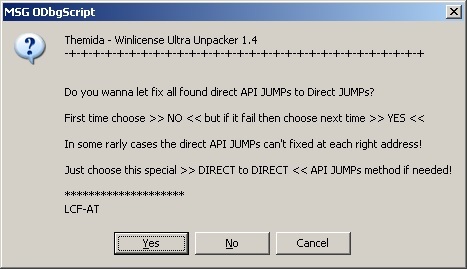 Ok the first thing we need do is set path in the Themida - Winlicense Ultra Unpacker 1.4.txt for your "ARImpRec.dl", so we open the txt with notepad and search it. 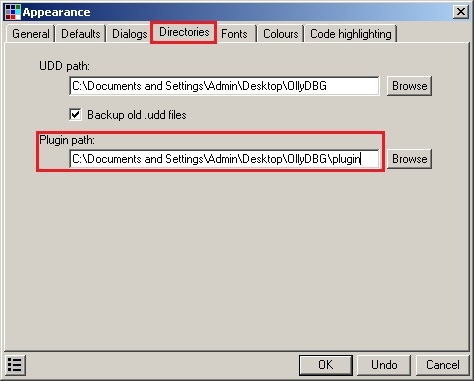 mov ARIMPREC_PATH, "C:\Documents and Settings\Admin\Desktop\OllyDBG\plugin\ARImpRec.dll"
Ok after checked that we unpack ollydbg in a path we want, a example mine is in Desktop: C:\Documents and Settings\Admin\Desktop\OllyDBG. So now we gonna create inside ollydbg folder a folder called plugin and inside we extract all plugins we download, so this need be look like that. 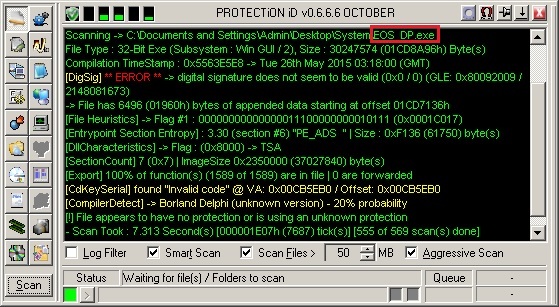 PS: delete PSAPI.DLL from main folder of OllyDBG. Ok so now we are ready to start with it. 1. 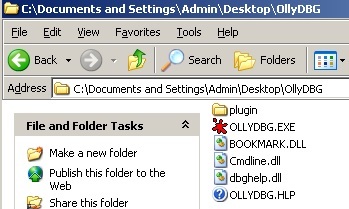 First time we open Olly we need set the plugin directory because is not configured, for do it we go to --> Option-Appareance, in the tab Directories we can set where we stored plugins, so do it, press ok and restart Olly. 2.So now the next time we open Olly we see plugins loaded. 3. Ok now we go open the target to unpack or just press F3, after opened we got a pop up, just press Yes and the file continue Analysing, just wait to finish. 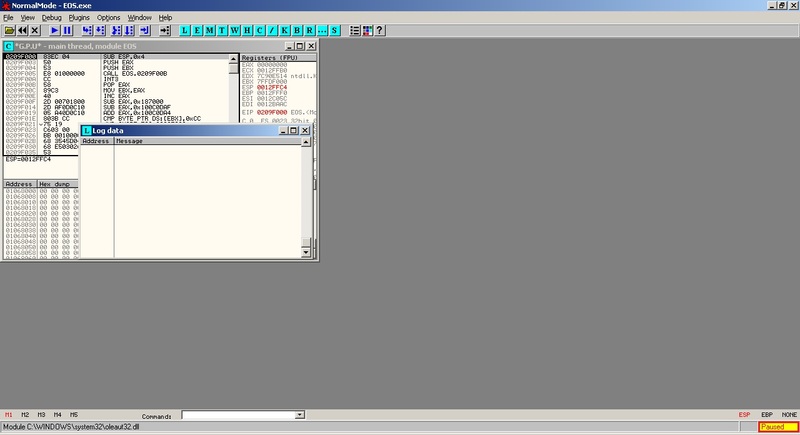 4.Now press F9 to run it and as you can see, we got a pop up, don't worry just press ok and the debug is terminated. 5. 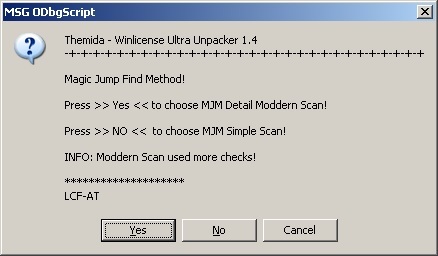 Good the next move is run script, so for this we go can do it via plugin menu-ODBGScript-Run Script and we search for "Themida - Winlicense Ultra Unpacker 1.4.txt" download before. 6.Ok after we load nothing happen becase we terminated the debug before, so what we need do is reopen the target, just press in the X to close target. 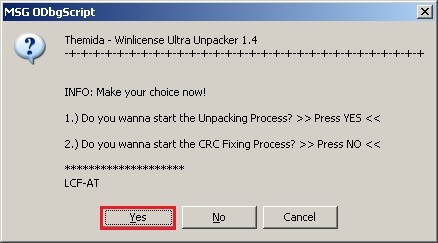 7.After reopened target run script again or if you get this pop up asking for begin unpacking process we press Yes. Ok next one we press No. So now the unpacking process has begun, we can check status in the down bar as the right side of screen, after some seconds, we got pause, now to resume and continue unpacking maximize main thread windows and press right click and go to -> Script Functions-Script Windows, so now we have a Window of Script opened, right click there and press Resume. 8. So now we got a pop up telling us about we need modify some values into "ollydbg.ini", after that we need restart Olly and resume script. 9. So now we repeat steps do before, open target and run script,etc, after we finish we got this at the end. PS: remember close OllyDBG after open .ini. 10. Ok we press Yes and in the Script Execution press right click and Resume. 11. Good now this part is very important, if we running a VMWare, we need set Yes, if we running normal SO just press No. 12. 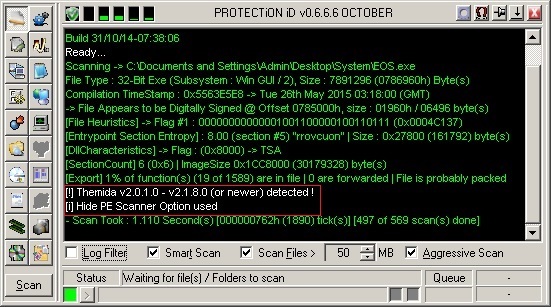 Now we got another pop up, really in my case I select Moddern Scan no Simple, it uses more checks. 13. Ok in this one we select No. 14. Ok after finished we got a new pop, there I press Yes. 15. Finally the job is done, as you can see there, now we can see dumped file, so we press Yes for use this data. 16. As script say, we choose first time no, if we got any problem after press no, repeat the process and the next time just press Yes, just in case. 17. Ok this pop ask for compress the dumped file, but in this case we won't do it because is a good size, is not a file of 120MB or 200MB so I think is fine press No. 18. Ok after all this we finally have dumped file in the folder where stored exe. Press ok and we are done. PS: Ok I hope this guide help us to unpack in future your themida protections, so well have fun and sorry if my english is to bad. Credits: LCF-AT, Nacho_dj and me for write this guide. Last edited by CriticalError on Sun Oct 16, 2016 5:02 pm, edited 3 times in total. I do in this way because you have a restriction with pictures up of 1024 pixels, so thats the problem, if you can change it I modify my post. The reason I added that limit was because, month ago, in every thread you added huge (and useless for the purpose of the forum) images of the games. P.S. : I have just removed the limit. Great tutorial but I packed a file I made myself with Themdia 2.3 and this failed to work. The executable would just crash, ill do some experiments and get back to you. Good job however taking your time to write this up sir! you can leave here or give me exe or dll you try unpack and I try myself. I'm sorry for the late reply, But when I'm done with all the steps mentioned and getting to the part where it should dump the unpacked file to disk I get a message says that the dumping failed and I should manually dump it by myself. How'd I manually dump the unpacked file? ummm well what target you trying unpack, maybe you can upload here and I try unpack myself to chekc what happen. Well, Protection ID says it's version between v2.0.1.0 to v2.1.8.0 (or newer). Is there any way to get more specific version of themida? well exit another tool called Exeinfo PE, you can check with them too, but anyway upload target here and I try unpack here. Check your inbox, I sent you the file in private. I did according to your instructions. But I cant unpack it.... You can unpack to help me. Or can support me unpack it. Please help me unpack it! well no idea what problem you got in the process, but here all be fine, anyway here is unpacked file. Do you unpack it by your way or another way? If you have free time, can you make a video decribe the steps you unpack it? When I run soft. It's show error. The soft can not run!!! it's packed with Winlicense, don't know the version, but PEid reported petite 2.2 which is not.